National Machinery Exchange has sold more rolling mills and related rolling equipment than any other dealer in the world. We handle many types of ferrous and non-ferrous mills, hot and cold mills, single stand or tandem mills, including 2-High, 3-High, 4-High, 6-High, 12-High, and 20-High both One-way and reversing mills. National Machinery Exchange handles everything from Hot Slab Mills to Foil Mills, Breakdown Mills, Temper Mills, Skin Pass Mills, Strip Cleaning Mills, Bar Mills, Rod Mills and More. We have buy, liquidate or auction complete plants and individual pieces of equipment. 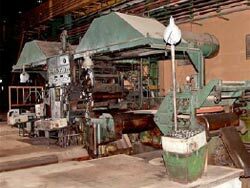 Contact us with all your rolling mill machinery needs.